With a 149-year history, Centerstone is a not-for-profit healthcare organization dedicated to delivering care that changes people’s lives. It provides mental health and substance abuse treatment, education and support to communities in Florida, Illinois, Indiana, Kentucky, and Tennessee and additionally offers individuals with intellectual and developmental disabilities life skills development, employment and housing services. Centerstone provides services to over 170,000 individuals and families in more than 200 facilities. In addition, Centerstone contracts with over 500 therapists in support of its national services network. Centerstone is CARF accredited in Illinois, Indiana and Tennessee and Joint Commission accredited in Florida and Kentucky. Centerstone’s Research Institute, established in 2008, supports the Centerstone mission of delivering care that changes people’s lives by advancing the science of behavioral healthcare and increasing the speed of access for individuals. This is achieved by empowering clinicians to provide the best care reinforced by the latest advancements and evidence-based practices. The Research Institute works to bridge the gap between science and service. Partnering with clinicians and other research professionals in academia and industry, the Research Institute provides research, analytics and evaluation services. Its efforts – including the development of Enlighten Analytics™ (an advanced business intelligence tool) – are funded through contracts, grants, foundations and individual donors who share the same commitment to advancing behavioral healthcare and recovery. Centerstone’s Military Services exists to ensure service members, veterans and their loved ones have the resources and support they need to lead healthy lives. This includes in-person counseling, therapeutic retreats and online support groups, classes and workshops essential to battling the effects of post-traumatic stress (PTS). Programs are provided through a variety of initiatives including face-to-face counseling, couples and family counseling, therapeutic retreats, housing assistance, employment counseling, physical health and wellness services, support groups, online resources, and 24/7 crisis services. In addition to the five states where Centerstone provides mental health and substance use treatment, Centerstone’s Military Services provides resources through a national network of over 1,100 contracted licensed, credentialed and military-competent providers. The Steven A. Cohen Military Family Clinic at Centerstone provides confidential, high-quality behavioral healthcare services, case management and connection to local resources at low to no cost to veterans, including National Guard and Reserves, and their families including spouse, partner, children, parents, siblings, caregivers and active duty families. Centerstone’s Foundation is the philanthropic arm of Centerstone and supports the work of Centerstone, directly impacting clients and their families, advancing research and service innovation. In addition to securing philanthropic resources, the Foundation is charged with providing effective stewardship of endowments, including investment and disbursements. The Foundation is dedicated to improving the quality of lives of individuals and families who come to Centerstone for care. In Florida, Centerstone is the leading community behavioral health hospital and outpatient practice in South Tampa Bay working to change the lives of children, teens, adults and seniors who face trauma, addictions, psychiatric illnesses and emotional disorders. It serves 15,000 clients each year. Centerstone Behavioral Hospital and Addiction Center, located in Bradenton, Fla., offers a private location for a client’s recovery. The hospital and addiction center are located together, which offers a level of care not offered by most addiction treatment centers. In Kentucky, Centerstone is the preferred provider of behavioral healthcare, substance use and developmental services in Bullitt, Henry, Jefferson, Oldham, Shelby, Spencer and Trimble counties of Kentucky. It is nationally recognized for innovative and effective services and treatments and is the largest non-hospital, not-for-profit employer in the Louisville Metro area. It has a staff of nearly 1,400 clinical and administrative staff members and serves more than 34,000 people annually. In Illinois, Centerstone serves children, youth, adults and families through mental health counseling, substance use treatment, life skills enrichment programs and services for adults with developmental disabilities. The organization serves over 12,000 individuals and families in south central Illinois and the Metro East St. Louis area. In Indiana, Centerstone provides a wide range of mental health and addiction services. Centerstone serves more than 27,000 children, adolescents, adults and seniors each year. The organization is known nationally for its recovery model for addictions. It also operates the Foster Care Select program in 24 counties. In Tennessee, Centerstone provides a wide range of mental health and addiction services to people of all ages. Centerstone serves more than 60,000 children, adolescents, adults and seniors. Centerstone is accredited by CARF International and is a member organization of the National Football League’s NFL LifeLine. 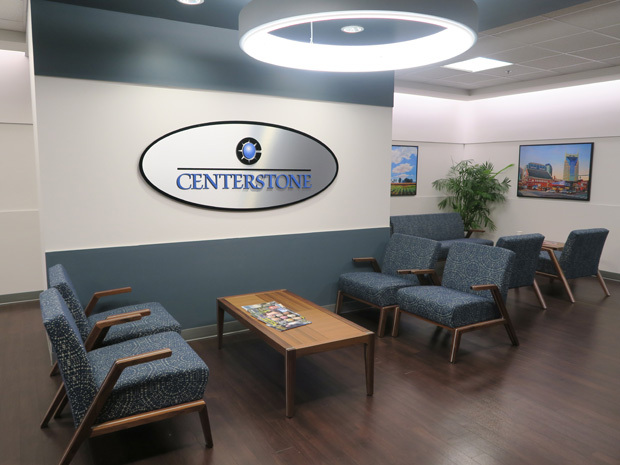 In addition to its traditional behavioral healthcare services, Centerstone Tennessee also offers primary healthcare in four of its middle Tennessee locations.